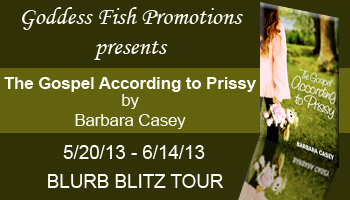 Barbara Casey will be awarding a $25 Amazon or B&N Gift Card to one randomly chosen commenter! The more you comment along the way, the better your chances of winning! Thank you so much for hosting me today. 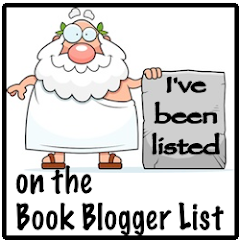 I am really looking forward to spending some time with your bloggers. I can't wait to put all these excerpts together, so to speak. Thank you, Mary. 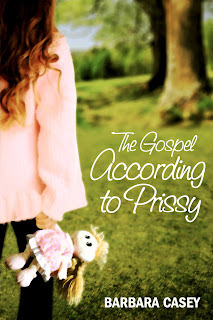 I have tried to give everyone a taste of what to expect in THE GOSPEL ACCORDING TO PRISSY without taking away from actually reading the book. So far we have talked about several of the characters that include Lara, the three men who once served in the Army and who have been floundering in life, but now have befriended Lara, Miriam Temple, the warden of the women's prison, Jake, Lara's husband, Bulah, Prissy's grandmother, and, of course, adorable Prissy. There are other characters who play key roles in the story, and today I am going to introduce you to Beth, the teenage daughter of Lara's best friend. Beth is just weeks away from high school graduation when she finds herself in the wrong place at the wrong time. The result is, she gets arrested for murder. How is that for a teaser? Thanks for stopping by, Mary, and for your comment. Every time I read this excerpt, I get angry and sad...knowing that there are women who suffer--in silence--from this kind of abuse and bystander complicitness. I know, Catherine. I wrote this so the reader would understand why Lara made the decisions she did. As terrible as this is, Lara does overcome it, and with the people she allows into her life, the story truly is beautiful. In fact, there is a lot of humor sprinkled throughout. The last thing I want is to write something that is a real "downer." THE GOSPEL ACCORDING TO PRISSY is not--in fact, it is just the opposite. Thank you so much for commenting, Catherine. Wow...so does being a judge for the pathfinder awards have any influence in how you write? Hi Andra. No, being a judge for the Pathfinder Awards has no influence at all on how or what I write. What it does do, though, is make me proud of the young people in high school. There is so much talent there. Normally we only hear about the bad stuff, but there are so many good kids in school. I think most of what I write comes from the fact that I moved around so much when I was growing up. My father was in the Marine Corps, so we got transferred every 2 or 3 years. Because of that, I got used to readjusting, but also I learned a lot just from being in so many different places and meeting so many different people. And I learned to "observe." It's funny, because even today--many years later--I will remember a certain gesture a person made or an unusual way of speaking. Most of it eventually winds up in one of my books. Glad you stopped by, Andra. Thank you. Each excerpt is so exciting. Can't wait to read the entire book. I can't wait for you to read the book either, MomJane. I don't think you will be disappointed. Thank you for your comment. Sounds like a very good book, I can't wait to read it. Thank you--I am glad you think so. I really would like to hear back from you after you read it. Catherine, one of the other bloggers, said that this excerpt makes her feel angry and sad when she reads it. It made me feel the same way when I wrote it. But THE GOSPEL ACCORDING TO PRISSY will make you feel a lot of different emotions, and in the end you will feel happy. I appreciate your comment. Please stop by again. I have had a wonderful time today, and I really appreciate everyone stopping by. Thank you again for hosting me. Hi Meghan. Thank you for your comment. Authors don't necessarily have to experience what they write about, but they do have to be good observers with a healthy dose of intuition. I am glad you stopped by. I just wanted to stop back by and let everyone know that my book, THE GOSPEL ACCORDING TO PRISSY, was just selected for the "2013 List of Best Summer Reads" by Conversations Live Radio/Conversations Book Club.